This a very interesting food to research. Bananas have been around since the beginning of time. Sweet nut breads and cakes were eaten by the ancient Roman and Greeks. Who decided to combine these two foods? According to the food historians, banana bread is a relatively is a recent phenomenon. In the early 20th century bananas were very popular and were used in many recipes. Nut breads (also sometimes known as tea cakes, muffins) were likewise popular. The earliest banana-nut combinations recipes we find are for salads! "Banana bread is said to have been invented by a Depression-era housewife in search of a way to make some extra money at home. It is curious that it took so long to discover, for since the 1930s, banana bread has taken its place on the menu in millions of homes. Grocery stores often provide customers with banana bread recipes when bananas have begun to brown, in a last-ditch attempt to sell their produce. Faced with overripe bananas, many cooks turned them into banana muffins or banana pancakes. Homemade banana bread is considered a thoughtful hostess present, good for breakfast, with a cup of coffee or tea, with lunch or dinner. In the twenty-first century, as fewer women have time to bake, banana bread is quick and easy, and it satisfies the urge to bake something fresh. There are even packaged banana bread mixes available for people without the time or inclination to mash their own bananas." Preheat oven 375 degrees. Grease 8x4 loaf pan. In mixing bowl, combine banana bread mix, water, vegetable oil, eggs, walnuts, sour cream and cinnamon. Stir well. Pour batter into loaf pan. Bake 40 to 50, or until toothpick inserted in center comes out clean. Enjoy! Help spread the word about Christine's Pantry. Share this post. There's additional share buttons on the sidebar. Thank you for your support. banana nut bread looks perfectly done,,Yumm !! I like banana nut bread and this one looks exceptional! I am surprised, like you, that banana bread was only 'discovered' in the 1930s.... seems like it has been around forever! Yummy! Looks yummy...I have not baked with premixed flour before. Thank you for all the wonderful comments. Love you all. Hope you enjoy the banana nut bread. I like banana in baking, always resulted a good bake! Christine-Banana bread is a staple in our house,and I make it often. Your banana bread is so inviting. It is comfort food and easy to make. Our dog loves bananas. We call her "Banana Girl". Banana bread!!! love it for breakfast . Yours is very nice especially with the walnuts. My dog also likes bananas. Absolutely love banana bread in this household and yours looks great, Christine. Love the addition of the sour cream. I bet it adds a good flavor. Am I here for the recipe or the food history? Hmmm. Both! I love both! Banana bread is among my favorite treats. The recipe looks pretty simple and straightforward as well. Christine, always a pleasure to visit your space. I love bananas, I have to have at least one a day :) This bread looks delicious, I especially love banana bread with nuts. 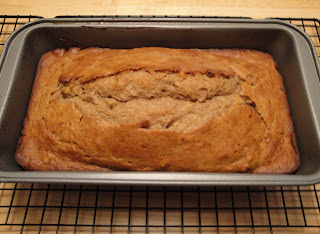 I think it gives it a lovely taste and texture compared to a simple banana bread without nuts. Great recipe Christine! 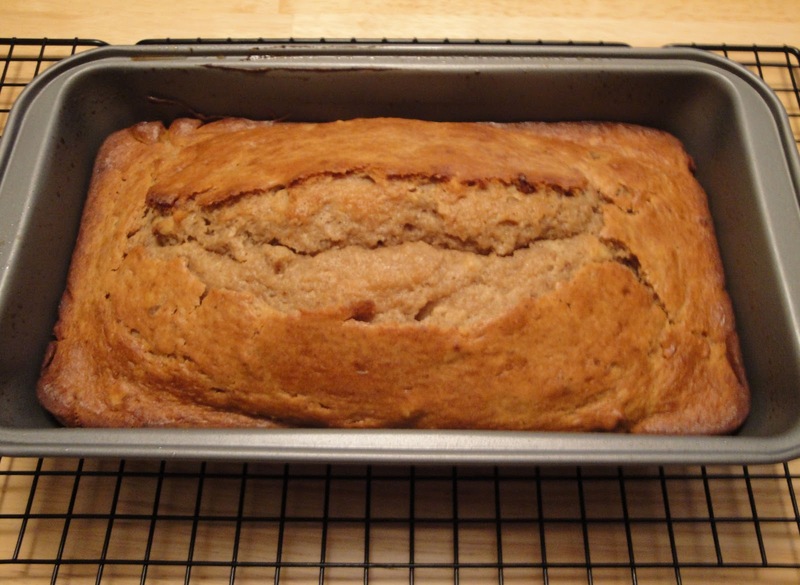 Banana Bread is my favorite kind of quick bread and yours looks really tasty! I am a big big fan of banana bread and loved hearing the history of it. Only around since the 1930s? Wow. My kids love banana bread. I should add nuts in the bread next time. It will enhance the great flavors for sure! I don't think I've ever baked banana nut bread from a mix, but I love how you've doctored it up!